For example, I want to use fft to transform the simple function exp(-x.^2) defined in time domain. And the corresponding funciton in frequency domain is sqrt(pi).*exp(-k.^2/4). In fact, I want to directly use the corresponding function in frequency domain to calculate the convolution with another function instead of fft(v). Is there any way to transform the corresponding function in frequency domain to the fft(v)? Browse other questions tagged matlab fft discrete-signals signal-analysis time-frequency or ask your own question. Why does my stop-band filter attenuate other frequencies? 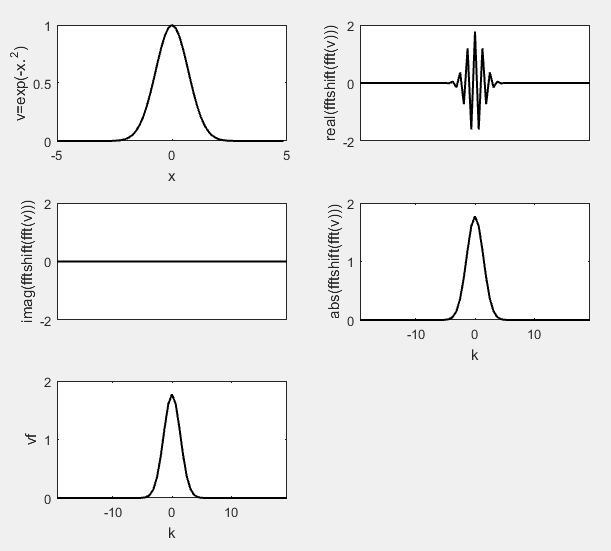 Why does the inverse fourier transform of a lowpass filter have complex components in matlab? How do I get excatly the same peak amplitude versus frequency when performing FFT?